Felipe Cuatecontzi ’17 – Mar. 12 was such a busy day. In all, the class made visits to the Pew Research Center, ICANN and NPR. When the day first began, I had a hard time understanding how these organizations could possibly correlate with our class, which focuses on the rhetoric that is present in government and politics. After having discussions with the professionals of these individual organizations, I understood that these organizations were voices that fell into the relationship of government and organizations. The first place we visited on that Wednesday morning was the Pew Research Center. It was explained to us that the Pew Research Center conducts research and polls to understand the relationship between religion and demographics in the United States. Leading the discussion was Dr. Gregory Smith, director of U.S. Religion Surveys, Religion and Public Life Project. Dr. Smith explained how religion is extremely important to monitor and analyze. Dr. Smith discussed that his research led to the conclusion that religion is the 2nd leading factor when determining the voting patterns of Americans, just behind race. This was very fascinating to hear, but what I found most fascinating was how Dr. Smith also went on to reveal that 1 in 5 Americans have no religious affiliation. These Americans are called “nones” as Dr. Smith labeled them. It was at this point in the discussion that you could notice an increase in question of how and why exactly religion is such an influence in how people vote. After leaving the Pew Research Center, the class headed over to ICANN, The Internet Corporation for Assigned Names and Numbers. Personally, I think that the acronym rolls of the tongue a little easier. It was at ICANN that we met Patrick Jones ’96, who is a senior director, to engage in a discussion with him. Jones told our class that ICANN aimed at not only connecting Americans domestically, but also internationally. The purpose of ICANN is to manage Internet resources thru the Internet’s domain system. ICANN has also been aiming to extend its boundaries by connecting with multi-stakeholders and by using certain strategies to overcome obstacles that include language, government and culture ICANN has begun to do so. One thing that I found a little ironic about our visit to ICANN was that the day of our visit also happened to fall on the same date as the 25th anniversary of the World Wide Web! Adam Pagryzinski ’14 – Mar. 14 – We like to think of gothic cathedrals as temporally static, giant stone anomalies which have escaped the passage of time; constants that connect us with the genius of a lost age. This perception of cathedrals as constant and unchanging engenders feelings of comfort, security, awe, and perseverance which speak to the human desire for universal truth, for immortality. The thought that these stone giants could be movable, transitory, or destructible is existentially troublesome, for how can something that has endured so long be subject to the fickleness of time, subjectivity, or human interpretation? This was the very struggle encountered today while exploring the cathedral of Notre Dame de Chartres. Despite the breath-taking exterior, intricate carvings, and the most magnificent stained glass windows ever created, the focus of our investigation and discussion was the partially complete renovation project seeking to return the cathedral’s interior to its original state. Rather than the gloomy, somber, and bare stone walls so associated with the gothic aesthetic and the medieval ages, we instead found brightly painted walls and columns in hues of yellow, red, green, and blue. The shadowy mysticism and cold uniformity of the building was lost, and along with it all the feelings and sentiments typically associated with the gothic. In the quest to rediscover the lost historical aesthetic of the cathedral, a different aesthetic truth has been destroyed. The perception of cathedrals held by modernity, although not true to history or the creators’ intent, has maintained for centuries and is engrained in the global mind. The traditional bare stone walls offer us something; they fulfill some need, satisfy some unique desire which remains unaddressed by society. While it is true that modernity has a duty to antiquity, to preserve and rediscover the lost realities of lost times, we must also be careful not to destroy the modern conception of the cathedral that has been developed over hundreds of years. It is evident after appreciating the cathedral in Chartres that the role cathedrals play in politics, community, religion, and society has changed since the birth of the gothic, however we must reach a balance between remaining true to the gothic aesthetic of antiquity and exploring the modern gothic interpretation lest we lose the many things that this new aesthetic provides. Derek Andre ’16 – Over the past week, 14 Wallys, myself included, had the opportunity to travel to the nation’s Capital as part of a Rhetoric course about the various rhetorical aspects of Washington, DC. Over the course of the week we were able to meet with Senator Joe Donnelly, Representative Luke Messer ’91, visit NPR, America Rising, and Prime Policy Group, and see all the sights that DC has to offer. The trip was designed to provide those of us in the course, entitled Voices of America: the Rhetoric of the Nation’s Capital, the opportunity to view DC firsthand and to take our acquired knowledge back with us so that we can create a final project analyzing some aspect of the District. Unlike the rest of the group, my project entailed a trip to Nationals Park, the home of the Washington Nationals. For my final project, I plan to analyze the rhetorical constructs surrounding Nationals Park, including the way that the park constructs a history for the young team and how the park plays into the overall rhetoric of DC. For my project, I took a tour of the ballpark, seeing the Presidential Lounge, the Washington Level suites, the clubhouse, and even throwing a pitch in the bullpen. Overall the tour yielded a surprising amount of interesting information and aspects of the stadium that will be useful in the analysis of the ballpark. While the trip was great for seeing the sights of DC and visiting a number of offices around the District, one of the most memorable moments took place during a discussion I had with our professor Dr. Sara Drury and two of my fellow students. As we were walking between the Korean War Veterans Memorial and the Vietnam Veterans Memorial we started discussing the ways those two memorials and the World War Two Memorial conveyed three very different messages when viewed at night. We talked about the lighting of the memorials, the presence or lack thereof of seating, the size and layout, and even the positioning of the three memorials. Without going into copious detail, the conversation embodied the critical thinking that is the backbone of a Wabash education. I’d like to thank Drs Sara Drury and Shamira Gelbman, Wabash College, my parents, and my classmates for making this phenomenal trip possible. Not only was the trip intellectually stimulating, but I also was able to solidify old friendships and make new ones. Last week when we flew out of Indianapolis I didn’t know what to expect. But one week, six memorials, a Capitol tour, a trip to NPR, and twelve games of euchre later, I can honestly say that an immersion trip to DC was a great way to spend a Spring Break. 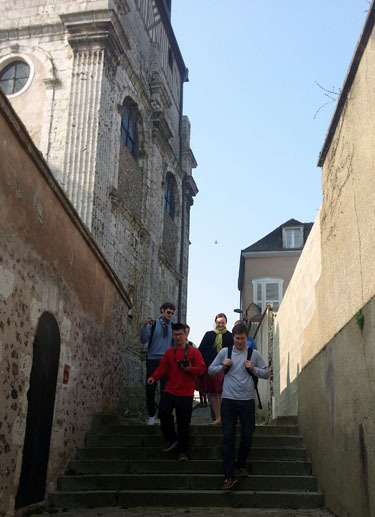 Austin Puckett ’15 – As our group entered into day five of being in Paris and studying the different Gothic themes of the Cathedrals in Paris and the surrounding cities, it was easy to tell that everyone was becoming more comfortable. Conversations started to become a little more organized and a little more passionate. That was largely in part because now we have seen multiple cathedrals, enough that we can start making comparisons and viewing common themes. One of the biggest aspects that I have found particularly interesting when we are looking at these cathedrals is the way in which the government of the time was and still is intertwined within the religious community. That is something that we have been asked to look at since day one and it is just something that is difficult to wrap your brain around. We visited the Cathedral of Notre-Dame de Reims today and one of the things we were told to look at was the way in which the kings of France were shown in stained glass windows at the very top of the church. The kings were even given their power inside of the cathedral and the coronations happened there also We find this so interesting because in America we mainly see a major separation of church and state and here we see the actually leaders of the country being displayed inside what is a holy, religious building. It wasn’t just at Notre-Dame de Reims in which we saw evidence for this; it was also at Notre Dame de Paris, where the statues that are located in the front are associated also with the 28 kings of Judah and Israel. We are not actually sure who the statues are supposed to be but throughout the years it has been accepted that they in some way they depict these kings. Obviously, there would have to be a reason for this intertwining to happen and it would have had to stem from the people. The reason I believe this happened is security. The people that resided in the town would have wanted security and to feel safe. That is what the cathedral gave these people, the sense that they were part of a bigger community and not a stranded individual. They lose themselves within the church and therefore feel safer. Another aspect of this churches that I have seen in almost everyone we have visited, something that I believe correlates well to the first idea, is the open space that is located in front of most of these cathedrals. The open space maybe today, is seen as a tourist area but what it could have been used for is amazing. Essentially you have a building where everyone goes to church to worship and then you have all this space out in front in which they all fit, this is where the two worlds collide. The church is where citizens went and citizens make up the city and therefore the government and church are intertwined. It was an inevitable merger that played out and has been personified within the walls of the church. There are stain glass windows that depict God giving the power to the King and also the fleur-de-lis is found throughout many of the churches. The idea that the church and the state being one is so foreign to us as Americans. We see that as something that would hinder the efficiency of the government but however the French embraced the idea and we can see that within the cathedrals that we are studying. The citizen went to the church for everything. If there was ever a problem, the church is where they would go. The readings only made me believe more in this idea that the church helps to manifest these principles of security and comfort within the individual. They gained knowledge of government and certain issues all while worshiping within the walls of the church. This was the idea that I found the most intriguing and challenging as I searched for a topic within the readings and group discussions we had. Mason Zurek ’16 – When I was signing up for this class, I was torn between whether or not to take it. I had yet to go on an immersion trip anywhere, but I had not gone on the fabled collegiate Spring Break trip. At the beginning of the immersion trip, as I received numerous Snapchats and texts about the sun, beach, and women, I feared I had made the wrong decision. I figured “Washington DC is not going anywhere soon, but I only have a couple Spring Breaks in college.” Yet, as the week went on, I realized the incredible opportunities that the immersion trip offered me. Washington D.C. has rhetoric of every type present: political, journalism, media, and public opinion. We studied them all. The politics part is simple: DC is the center of politics in the United States. The Newseum offered a funny and entertaining perspective on journalism and media (there was an Anchorman exhibit). Public opinion was on display when we met with America Rising and heard the procedures and ways opinion is shaped during campaigns. DC is an incredibly rhetoric-rich environment and probably the best place to study for a major like myself. From meeting with lobbyists who could contact some of the most powerful people in DC with a single phone call to chatting with Representative Messer, a Wabash Phi Delta Theta graduate, the people we met and the things we did were once in a lifetime events. I cannot foresee having another chance to tour the FBI or any of a number of things we did, and I realized the true beauty of the trip was networking: professionally and personally. On the professional side, I was able to meet and connect with a large number of alumni who were more than happy to offer advice and their business card. Even better was their insight into life in the city and after college. I learned it is quite important to establish yourself young in order to advance later in life. Personally, I was able to bond with my classmates and fellow Wabash brethren in a new way. The 14 of us went everywhere together and had some discussions that I never would have expected. The Democrats and Republicans sparred on a bunch of issues, gay marriage was debated, and the intricacies of Tinder were brought up at shockingly regular intervals. It was refreshing to go outside of my friend circle and connect so well with other Wallies. In conclusion, I had an incredible trip. The meetings, camaraderie, and city itself were wonderful. Wabash Immersion Trips are experiences everyone needs to have before they graduate, even if you skip going to Florida. It is most definitely worth it. 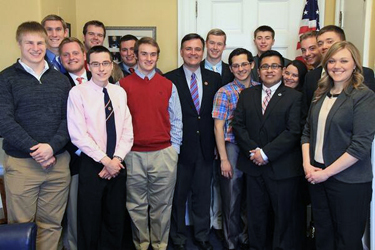 Rep. Luke Messer ’91 with Wabash Rhetoric Class. Tyler Regnier ’16 – Today was our last day in D.C. To start the day, Kyle Stucker ‘17 and I toured the Library of Congress. The tour guide enlightened us with hidden insights about the meaning of the elaborate murals and carvings that fill the Jefferson building of the library. The designer wanted to build something as grandiose and ornate as a European structure, in order to show the European world powers in the 1800’s that the United States could compete with them. The space certainly conveys power by aesthetically overwhelming one’s senses with massive marble columns and vivid and colorful murals. The design of the building not only conveys the political power of our nation, but also the power and value of knowledge. The Great Hall and the Main Reading Room feature murals and sculptures that speak to the different subjects housed in the library. From corner to corner, the building is filled with symbolism. For instance, the golden light fixtures at the main entrance to the building have thirteen bulbs to represent the thirteen original states. Being the first building in D.C. to be wired for electricity, people came to the library just to marvel at the light fixtures. After lunch we met with Representative Luke Messer (class of ’91) in his office on Capitol Hill. I think it’s safe to say that the whole group enjoyed sitting down to chat with him. He gave us a perspective on working on Capitol Hill, trying to balance family and work, as well as keeping his presence in Indiana while in Washington. As Wabash men often do, we felt a sense of camaraderie as he told us of his days at Wabash as a part of the Wabash football team and a member of Phi Delta Theta. After our meeting with Representative Messer, we met with Prime Policy Group, one of D.C.’s first truly non-partisan lobbying agencies. Library To end the day, I visited the major monuments of D.C. with Dr. Karl Grimmer (class of ’03) who now resides in D.C. The monuments were majestic at night, especially the Jefferson, brightly lit with the wind whistling through the pillars and the sound of the water lightly crashing into the dam. The Lincoln seemed to really speak to his power and the effect he had on our nation. With its grand columns, slightly resembling the Parthenon, and the massive, gleaming white statue of Lincoln himself, the monument conveyed his graceful power and immeasurable influence on the U.S. Almost equally as powerful, was standing in the spot where MLK gave his “I Have a Dream” speech. With Lincoln over my shoulder, looking out at the moonlit mall where thousands gathered in hope of justice, I got a sense of the pivotal moments in civil rights that have happened in our nation’s capital. It helped me realize how fitting it was for MLK to give the speech from the steps of the Lincoln memorial, because the only other man that had such a strong and positive effect on civil rights in the U.S. stood right behind him. Alex Hernandez ’14 – Friday was a phenomenal ending our trip. I was able to visit the National Education Association (NEA), National Council of La Raza (NCLR), Indiana House Representative Luke Messer, Prime Policy (a lobbying) Group, and the Human Rights Campaign. Due to the fact that I had to sign up for an appointment weeks prior to the trip, I was not able to have the grand tours of NAE and NCLR; however, I was still was able to interrogate the front desk on what their organizations stood for and what types of opportunities (i.e. internships and externships) they had, so it was not a total loss because this potentially gives me another reason to go back to D.C. Following NEA and NCLR, my class and I were able to visit House Representative Messer and the Prime Policy Group. Being a non-Indiana resident and not familiar with Indiana’s congressional representatives, I did not know who House of Representative Messer was or his platform. On the other hand, the way he interacted with us was pretty neat. Many people believe that politicians or those that hold high offices do not have a laid back personality because they have to continue with the professional façade, however he welcomed us with a big smile and a fraternal environment. He told us about his time at and after Wabash, which gave me a reassurance that Wabash College is worth all these sacrifices, especially being away from home. On a side note, I wonder if my Texas representatives, or even President Barack Obama, are able to interact with people a personal level. After meeting with Congressman Messer, my class and I got to meet with the Prime Policy Group. Honestly, this group was my favorite of them all because of not only the panel but also because of what they do and what their organization stood for. The work they did and the message that they conveyed through their organization is very impressive because they work from as much of a collective and bipartisan standpoint as possible. The sense of community that they created was concrete because they had to learn how to hear out and respect opposing ideas and beliefs. Somehow, to paraphrase what they said, we just agree to disagree. This polarization has weakened our government and society. Personally, what stood out the most was the sense of unity and humility that our panel portrayed. Everybody in our panel were from different generations and backgrounds, but the way they interacted with each other and with us was just plain awesome. Even though they were from an earlier generation than ours, they were able to interact with each other and us as if they were in their twenties again; their diverse backgrounds and passion for their work, shows that their organization is a place to consider as a potential future workplace. The Human Rights Campaign was another place that I enjoyed exploring. As a demonstration of the power of Wabash alumni, I was able to explore the organization because my host Gary James had his friend Noel, who works in HRC, take time out of his hectic schedule and give me a personal tour of the organization and the people. The interactions I had and the warm welcome that I received from this organization motivated me to apply to their summer internship, so wish me luck! Overall, my Friday, as any other day in the week, was just plain awesome. D.C is a place that I see myself enjoying living in. Stephen Sklar ’15 – In Political Theory one can use architecture to provide a sense of place and time where ideas were originally produced. Difficulty with this method naturally arises when the architecture is changed or renovated. After observing the Chartes Cathedral one may encounter this difficulty. The new painting of the sidewalls in the back of the cathedral, which in turn redefines what something meant to be gothic, causes this conception. With this new belief one can also take a different view on the royalty’s use of power. French cathedrals all possessed many of the same qualities. When the standard person reflects on a vision of a gothic cathedral, one will most definitely think of dark shadows and large grey stones. With their use of light, many gothic cathedrals possess a feeling of mystery and sometimes almost fear. Some remark that the dissolution of light from the stain glass projected on the walls creates an atmosphere of unity or oneness. This theme, which one can draw from the gothic cathedrals, can be transferred to themes in Medieval Political thought. However, all this changes when someone introduces color to the walls. Chartes does not possess unity; it is just another pretty church. Chartes Cathedral’s treatment of light is almost unnoticeable in the front of the church. Although, the windows are beautiful, the soaring magnificence of shadow from the floor on upward is lost due to the reason of the pillars flanking the center of the church are now painted in a brownish color. For this single reason one could postulate that the Chartes Cathedral new coloring made it lack the gothic feel. If this is to be true then the modifications of the cathedral have desecrated this once gothic church and transformed it into something else. Yet, to one’s own surprise the painting of Chartes is mimicking how it was decorated in the 12th century and throughout the medieval times. So what truly is Gothic? The common view of the medieval is skewed. Most people conceive that the classic gothic church is a dark dreary place to its lack of paint. This derives itself from the churches presentation in the modern day as paint lacking. In spite of this, the medieval Gothic church actually was painted fully and the shadow and darkness that most people preconceive in their minds of the gothic is only a modern notion. This in turn forces one to rethink all of medieval political thought. Cathedrals among other symbols represent France. The cathedrals were a conduit for emotion and thought including that of political actions by the ruling kingdoms such as, the coronation or the funerals of the ruling class. One could immediately assert that there is a massive difference from celebrating the royalty in a dark place without paint to a beautifully painted cathedral. The effect on the individual would be me more calming and festive than that of pure subjection to the royals. The gothic cathedral can now be thought of as a more joyous institution. The painting in the gothic church actually makes sense if one asserts that the royalty, to bring joy to their followers and to provide a beautiful place to contemplate and feel secure did the painting on purpose. One must change their notions about the gothic as a truly mysterious institution to that of a joyous place subtly showing subjection. One can make this notion for the reason that the preconceptions of the gothic being dark do not relate to the church’s origin being painted and bright. This impression changes one’s view on the purposeful actions of the royalty and their desire to remain in power. 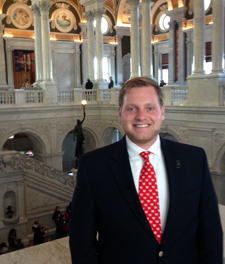 Cole Chapman ’16 – Arriving in Wittenberg, we weren’t sure what to expect. The quaint little train stop did not seem to fit our mold of the Wittenberg we had read of in books. Instead, it was this small town which had so much history packed into each stone. We traversed the streets to the Marktplatz where two beautiful statues of Luther and Melanchthon stood. Not too far past that was our hotel, which gave us some prime-time real estate. After lunch at Tante Emma’s and a small walk, we arrived at the Lutherhaus. It was quite large for the humble Luther we had experienced in class. The sheer volume of Luther history was unbelievable. The impact that Luther had could be seen in items such as the disputation bench which bears his image. We wandered through the museum, encountering things such as the judgment sword of Wittenberg, which Luther saw as a symbol of power over the body, but not the soul. One of the most fascinating items to see was one of Luther’s first prayer books and his translation of the Bible into German. Both of these articles had extreme importance to Luther in his time, and continue to be important around the world today. After our visitation, we met Bishop Guy Erwin for dinner at a local restaurant. The only proper way to end the night was with good food and good friends, which was exactly what we did. Jacob Sheridan ’14 & Stephen Fenton ’14 – Se were at the Fredericksburg battlefield Friday visiting the other three civil war battlefields in Spotsylvania County, Virginia. The four battles together resulted in approximately 15,000 fatalities, making it the bloodiest area of the civil war. The tour guide we had was one of the best of the trip, and he wasn’t even a park ranger, but just a private historian. Unlike most of our other battlefield visits, the Spotsylvania battlefield did not seem to be at all preserved. In fact, the tour guide told us how he has fought to preserve some of the battlefield, but unfortunately most of it has been lost to developers. We learned about General John Sedgwick whose troops were being harassed by confederate sharpshooters all day. Against the advice of his subordinate officers, Sedgwick moved towards the front line to personally direct the placement of the infantry and artillery. Once there, he saw that his men were literally trying to dodge the sharpshooter’s bullets, which disappointed him greatly. Sedgwick said, “They couldn’t hit an elephant from this distance.” Soon after uttering this phrase, Sedgwick was fatally hit by one of these confederate sharpshooters. We also visited the spot of the Bloody Angle where the bodies were stacking up three and four high due to the intense close combat. In fact, there was a large oak tree that was cut through on one side with so much musket fire that it was knocked over. We also drove through parts of where the Wilderness battle would have taken place, but because the battle essentially happened in the woods, we did not extensively visit this site. It is believed that there are still many human remains on the Wilderness battlefield. At Chancellorsville, we were able to follow the approximate path that Stonewall Jackson used to flank his 28,000 men in place to attack the union forces. They made this 12-mile trip with nearly 40 pounds of gear in around eight hours. Luckily for us, we drove the distance making much better time, but the feat of Jackson’s men was nonetheless impressive. This risky maneuvering, which had cost General Robert E. Lee at Antietam, proved quite beneficial at Chancellorsville where the confederates achieved victory.